Most of the time zones on land are offset from Coordinated Universal Time (UTC) by a whole number of hours (UTC−12 to UTC+14), but a few are offset by 30 or 45 minutes (for example Newfoundland Standard Time is UTC -03:30 and Nepal Standard Time is UTC +05:45). Some higher latitude countries use daylight saving time for part of the year, typically by changing clocks by an hour. Many land time zones are skewed toward the west of the corresponding nautical time zones. This also creates a permanent daylight saving time effect. Before clocks were invented, people marked the time of day with apparent solar time (also called "true" solar time) – for example, the time on a sundial – which was typically different for every settlement. When well-regulated mechanical clocks became widespread in the early 19th century, each city began to use some local mean solar time. Apparent and mean solar time can differ by up to around 15 minutes (as described by the equation of time) due to the non-circular shape of the Earth's orbit around the sun (Eccentricity) and the tilt of the Earth's axis (Obliquity). Mean solar time has days of equal length, and the difference between the two averages to zero after a year. Local solar time became increasingly awkward as rail transport and telecommunications improved, because clocks differed between places by an amount corresponding to the difference in their geographical longitude, which varied by four minutes for every degree of longitude. The difference between New York and Boston is about two degrees or 8 minutes, the difference between Sydney and Melbourne, Australia, is about 7 degrees or 28 minutes. Bristol is 2°35′ W(est) of Greenwich (East London), so when it is noon in Bristol, it is about 10 minutes past noon in London. The use of time zones smooths out these differences. The increase in worldwide communication had further increased the need for interacting parties to communicate mutually comprehensible time references to one another. The problem of differing local times could be solved across larger areas by synchronizing clocks worldwide, but in many places the local time would then differ markedly from the solar time to which people were accustomed. .
Charles F. Dowd proposed a system of one-hour standard time zones for American railroads about 1863, although he published nothing on the matter at that time and did not consult railroad officials until 1869. In 1870 he proposed four ideal time zones (having north–south borders), the first centered on Washington, D.C., but by 1872 the first was centered 75°W of Greenwich, with geographic borders (for example, sections of the Appalachian Mountains). Dowd's system was never accepted by American railroads. Instead, U.S. and Canadian railroads implemented a version proposed by William F. Allen, the editor of the Traveler's Official Railway Guide. The borders of its time zones ran through railroad stations, often in major cities. For example, the border between its Eastern and Central time zones ran through Detroit, Buffalo, Pittsburgh, Atlanta, and Charleston. 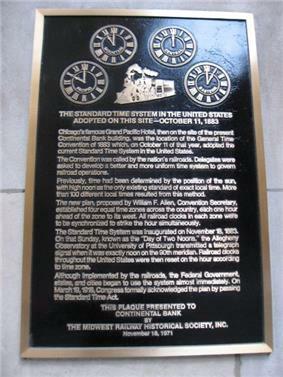 It was inaugurated on Sunday, November 18, 1883, also called "The Day of Two Noons", when each railroad station clock was reset as standard-time noon was reached within each time zone. The zones were named Intercolonial, Eastern, Central, Mountain, and Pacific. Within a year 85% of all cities with populations over 10,000, about 200 cities, were using standard time. A notable exception was Detroit (which is about half-way between the meridians of eastern time and central time), which kept local time until 1900, then tried Central Standard Time, local mean time, and Eastern Standard Time before a May 1915 ordinance settled on EST and was ratified by popular vote in August 1916. The confusion of times came to an end when Standard zone time was formally adopted by the U.S. Congress in the Standard Time Act of March 19, 1918. Scottish-born Canadian Sir Sandford Fleming proposed a worldwide system of time zones in 1879. He advocated his system at several international conferences, thus is widely credited with their invention. In 1876, his first proposal was for a global 24-hour clock, conceptually located at the center of the Earth and not linked to any surface meridian. In 1879 he specified that his universal day would begin at the anti-meridian of Greenwich (180th meridian), while conceding that hourly time zones might have some limited local use. He also proposed his system at the International Meridian Conference in October 1884, but it did not adopt his time zones because they were not within its purview. The conference did adopt a universal day of 24 hours beginning at Greenwich midnight, but specified that it "shall not interfere with the use of local or standard time where desirable". Today, all nations use standard time zones for secular purposes, but they do not all apply the concept as originally conceived. Newfoundland, India, Iran, Afghanistan, Venezuela, Burma, Sri Lanka, the Marquesas, as well as parts of Australia use half-hour deviations from standard time, and some nations, such as Nepal, and some provinces, such as the Chatham Islands, use quarter-hour deviations. Some countries, most notably China and India, use a single time zone, even though the extent of their territory far exceeds 15° of longitude. Before 1949, China used five time zones. Time zones are based on Greenwich Mean Time (GMT), the mean solar time at longitude 0° (the Prime Meridian). As the rate of rotation of the Earth is not constant, the time derived from atomic clocks is adjusted to stay within a second of UT1. In January 1972 the length of the second in both Greenwich Mean Time and atomic time was equalized. The readings of atomic clocks are averaged to give a uniform time scale. Because the length of the average day is currently 0.002 second more than 24 hours, leap seconds are periodically inserted into Greenwich Mean Time to make it approximate to UT1. This new time system is also called Coordinated Universal Time (UTC). Leap seconds are inserted to keep UTC within 0.9 seconds of UT1. Because the Earth's rotation is gradually slowing, leap seconds will need to be added more frequently in the future. However, from one year to the next the rotation rate is slightly irregular, so leap seconds are not added unless observations of Earth's rotation show that one is needed. In this way, local times will continue to stay close to mean solar time and the effects of variations in Earth's rotation rate will be confined to simple step changes relative to the uniform time scale (International Atomic Time or TAI). All local times differ from TAI by an integral number of seconds. With the implementation of UTC, nations began to use it in the definition of their time zones. 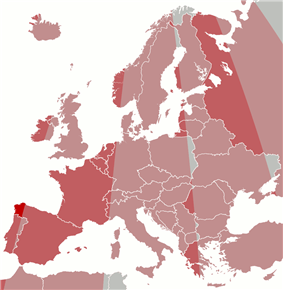 As of 2005, most nations had altered the definition of local time in this way. 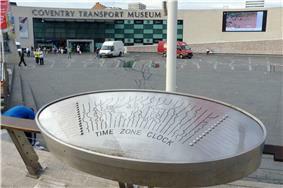 In the United Kingdom, this involved redefining Greenwich Mean Time to make it the same as UTC. British Summer Time (BST) is still one hour in advance of Greenwich Mean Time and is therefore also one hour in advance of Coordinated Universal Time. Thus Greenwich Mean Time is the local time at the Royal Observatory, Greenwich between 01:00 GMT on the last Sunday in October and 01:00 GMT on the last Sunday in March. Similar circumstances apply in many other places. Leap seconds are considered by many to be a nuisance , and ways to abolish them are being considered. This means letting the time difference accumulate. One suggestion is to insert a "leap-hour" in about 5,000 years. A time offset is an amount of time subtracted from or added to UTC to get the current civil time - whether it's standard time or Daylight saving time. In any particular time zone residents either observe standard time all year round (as in Russia or South Africa) OR they observe standard time in winter and daylight time in summer. 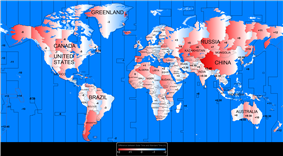 Polemical map showing how a great part of the world has a gap between the official time and the solar. It is not updated for Russia, where there is less offset from 2014. The time-zone adjustment for a specific location may vary because of daylight saving time. For example New Zealand, which is usually UTC+12, observes a one-hour daylight saving time adjustment during the Southern Hemisphere summer, resulting in a local time of UTC+13. A ship within the territorial waters of any nation would use that nation's standard time, but would revert to nautical standard time upon leaving its territorial waters. The captain is permitted to change the ship's clocks at a time of the captain’s choice following the ship's entry into another time zone. The captain often chooses midnight. Ships going in shuttle traffic over a time zone border often keep the same time zone all the time, to avoid confusion about work, meal, and shop opening hours. Still the time table for port calls must follow the land time zone. Web servers presenting web pages primarily for an audience in a single time zone or a limited range of time zones typically show times as a local time, perhaps with UTC time in brackets. More internationally oriented websites may show times in UTC only or using an arbitrary time zone. For example the international English-language version of CNN includes GMT and Hong Kong Time, whereas the US version shows Eastern Time. US Eastern Time and Pacific Time are also used fairly commonly on many US-based English-language websites with global readership. The format is typically based in the W3C Note "datetime". However, the standard has a somewhat naive understanding of time zones. It generally assumes a time zone can be specified by a simple offset from GMT. This causes problems when trying to do arithmetic on dates which span daylight saving time transitions or which span political changes in time zone rules. Stores date and time information with respect to the dbtimezone (which cannot be changed so long as there is a column in the db of this type), automatically adjusting the date and time from the stored time zone to the client's session time zone. PostgreSQL uses the standard SQL data types but tries to impose an interpretation which avoids the problems described above. Stores date and time in UTC and converts to the client's local time zone (which could be different for each client) for display purposes and conversion to other types. Stores date and time without any conversion on input or output. When converting to a TIMESTAMP WITH TIME ZONE, interprets it according to the client's local time zone. Stores time of day together with a UTC offset in which it is to be interpreted. Stores time of day without any time zone specification. Orbiting spacecraft typically experience many sunrises and sunsets in a 24-hour period, or in the case of Apollo program astronauts travelling to the moon, none. Thus it is not possible to calibrate time zones with respect to the sun, and still respect a 24-hour sleep/wake cycle. A common practice for space exploration is to use the Earth-based time zone of the launch site or mission control. This keeps the sleeping cycles of the crew and controllers in sync. The International Space Station normally uses Coordinated Universal Time (UTC). ^ "Resolution concerning new standard time by Chicago". Sos.state.il.us. Retrieved 2011-12-05. ^ Quirico Filopanti from scienzagiovane, Bologna University, Italy. ^ The Astronomical Almanac 1983, US Government Printing Office (Washington) and Her Majesty's Stationery Office (London), page B4. ^ Poulle, Yvonne (1999). "La France à l'heure allemande". Bibliothèque de l'école des chartes 157 (2): 493–502. ^ "Guidelines for Ubuntu IRC Meetings". ^ Author:. "pytz module". Pytz.sourceforge.net. Retrieved 2011-12-05.